Orchid care is important for orchids. Orchids, easily recognizable by their long stems and exotic brightly colored blooms, symbolize many things like beauty and love, strength, luxury, and power. They’re incredibly elegant, make great gifts, and can enhance the beauty of any space. And what’s great is that orchid care for beginners is easy, so if you have the proper growing conditions, it won’t be difficult to learn how to care for your orchid plants. Want to grow beautiful, long-lasting orchids that will wow you and your guests? Keep reading for 10 tips of orchid care for beginners. Taking care of orchid plants is easy if you know what you’re doing. Here are some basic indoor orchid growing tips that every beginner should know. There are nearly 30,000 species of orchids in the world, spanning across six continents, so orchid care for beginners requires knowing about the kind of orchid you’re growing. If possible, you should know the exact name of your orchid, and if you can’t find that information out you should at least know what type of orchid it is. If you don’t have a tag or are unsure, you can bring your plant to a local orchid society to have it identified. By knowing what type of orchid you have, you’ll have able to find out the basic light, water, and temperature needs for your orchid. When it comes to growing orchids indoor, providing them with the right amount of sunlight is essential. It’s also important to know that the kind of lighting you need to provide your orchid depends on the type of orchid they are. Medium-high light orchids grow best in locations that are bright but not in direct sunlight. Medium-low light orchids do best near east-or west-facing windows with no direct sunlight. And low light orchids do best when the light is blocked by trees or neighboring buildings. Most orchids like a 10-15?F drop in temperatures at night. What’s nice though is that most orchids grow well at the same temperature as other houseplants, so you won’t have to treat them differently than your other houseplants. Most orchids like the humidity in a room to be about 70%. This is a lot more humid than most homes, so you’ll need to take some extra steps to provide your plants with this amount of humidity. You can do this by doing things like misting your plants with a spray bottle. This is especially helpful for plants with aerial roots growing out of the pot. You can also set up a humidity tray, which will provide some extra humidity for the plant. When it comes to orchid care for beginners, you must avoid overwatering it, as that is the number one killer of orchids. Orchids are usually potted in bark mix rather than potting soil, so they need to be watered differently. You should never allow your orchid plants to sit in still water, and you should never water them at night, as that encourages bacterial and fungal diseases and allows the water to stagnate. By considering these factors and educating yourself about your orchid, you can master this main rule of orchid care for beginners. Your orchids will grow best in an environment most like their native one. So when you’re considering an orchid type, you should think about what species are best suited for your home, and how much effort you’re willing to put into accommodating their needs. The great thing about orchid is that there are many kinds of them, so there is bound to be one that matches your environment. You’ll be setting yourself up for failure if you buy an orchid that likes the opposite kind of environment that you can provide them. An important part of orchid care for beginners is fertilizing your orchids properly. In the wild, orchids get very fertilization, but they can actually grow well and vigorously if you fertilize them. 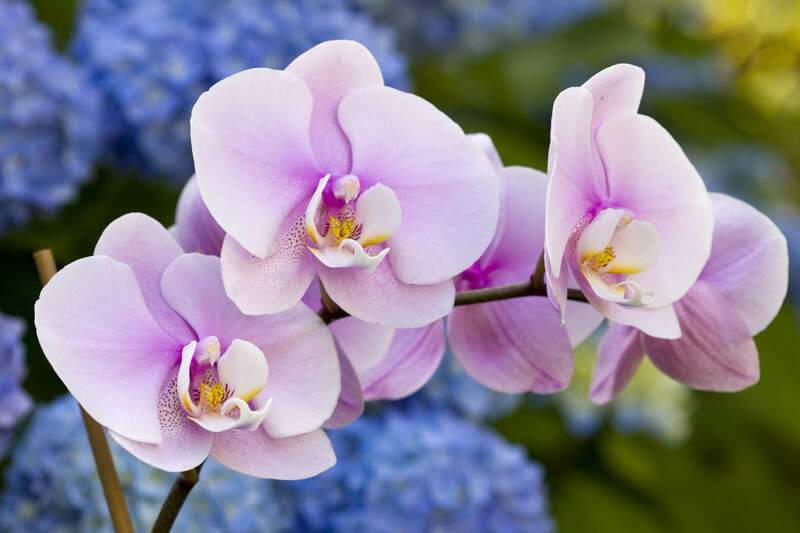 You should know that orchids are very sensitive to salt, so you should avoid fertilizers that include them. When you fertilize you should do it during the growing season, and only use the fertilizer at half the strength that’s listed on the package. You should also only do it once a week when you water the plant, as this will ensure that orchid will absorb the fertilizer. One of the most important parts of orchid care for beginners is investing in the quality potting materials needed for success. 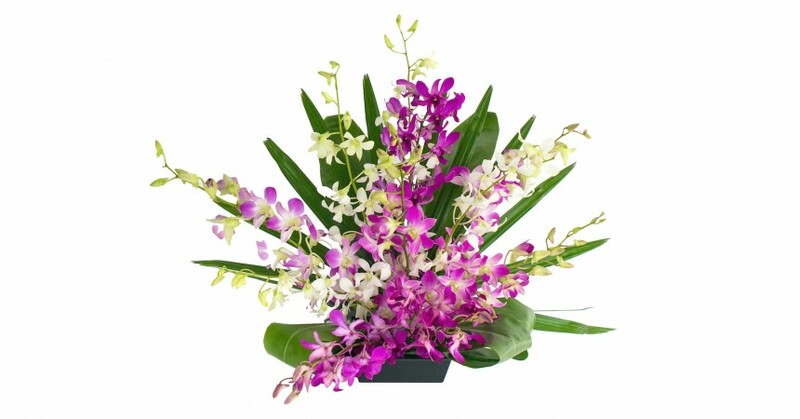 You should try to buy from a professional orchid vendor and ensure that it will be potted in a proper mix. By doing this you can make sure your orchid is healthy and ready to grow in your home. When buying your orchids, you should ask the buyer everything you need to know about your plant. They can tell you what conditions the plant has seen recently, and any special considerations that your plant may need. The buyer is more likely to be able to answer your questions about your orchid species than the Internet, so you’ll be better prepared if you ask them. As most orchids are from tropical regions, they’ve evolved to fight off tropical bugs, so they may not be as suited for dealing with bugs that live in our temperate regions. The key to fighting off pests and diseases is providing your orchid with the proper lighting, humidity, and temperature to keep them strong enough to ward them off. Also, regularly inspect your orchid for any bugs or insects and if you’re struggling speak to an orchid expert to help you! With their vibrant color and tropical style, Orchids may a great addition to any home. By following these 10 tips, you can master orchid care for beginners and ensure your orchid will live a long and healthy life. Are you looking to bring some beautiful orchids home? The good thing is there are fantastic orchids available online, and many of them ship free! Let us know what you think of this orchid of the month in the comments! Ti (or “ki“ in the Hawaiian pronunciation) is one of the most versatile plants in Hawaii. 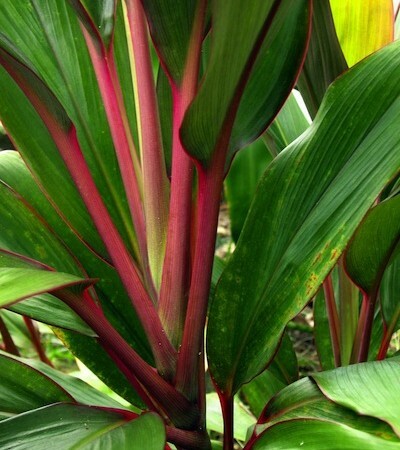 This plant was brought to Hawaii by early Polynesian settlers who knew of its many uses. The most useful part is the leaf. Ti leaves are a foot or two long and about four inches wide. They have a firm stem or bone that runs through the middle of the leaf. In Hawaiian culture the ti leaf is associated with the hula and its goddess, Laka. 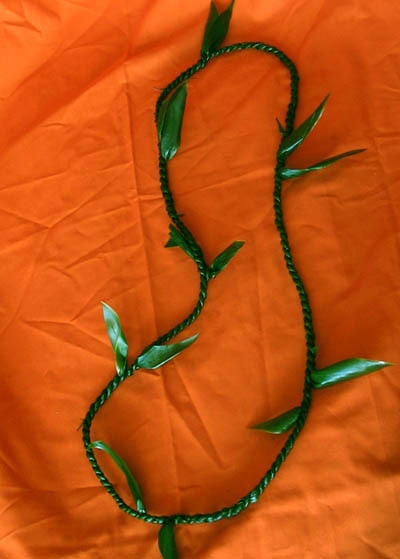 Ti leaves were also used in rituals to invoke the god Lono and to ward away evil. Even today in Hawaii you will see new ventures such as buildings or equipment bless by a kahuna holding ti. The leaves were also used for clothing. Ti can be fashioned into a skirt for hula or a cape worn on the shoulders. Children are known to create a makeshift sled for going down grassy hills. The leaves naturally shed water when fresh. The roots of the ti plant are tuberous and can be baked for eating or fermented into a beverage. The scientific name is Cordyline terminalis or fruticosa. The plant thrives with just a little sun and is a common site both when hiking in Hawaii or in landscaping. The can be grown by rooting the leaves or from the rhizomes in the ground. The plant does produce a flower and small fruit though it is mostly prized for its leaves. There are two types of basic ti leaf leis you can make. These are the braided or hilihili style or the maile style. Maile style ti leaf leis are often worn by men in weddings and are less expensive than true maile leis. To begin you will need enough leaves to make each lei. For braided leis have about six or eight on hand. Have about ten for maile style as you need to join the leaves with inserts. Note that we have ti leaves for sale on our site. To work with the leaves you will need to trim out the spine and freeze them overnight. You might want to have some extra leaves on hand in case of accidental tearing when you work. You can also add a strand of orchids or tuberose to the maile style lei as well as a few orchid blossoms to the braided style. Here is a good article on making ti leaf leis as well as a video from YouTube. 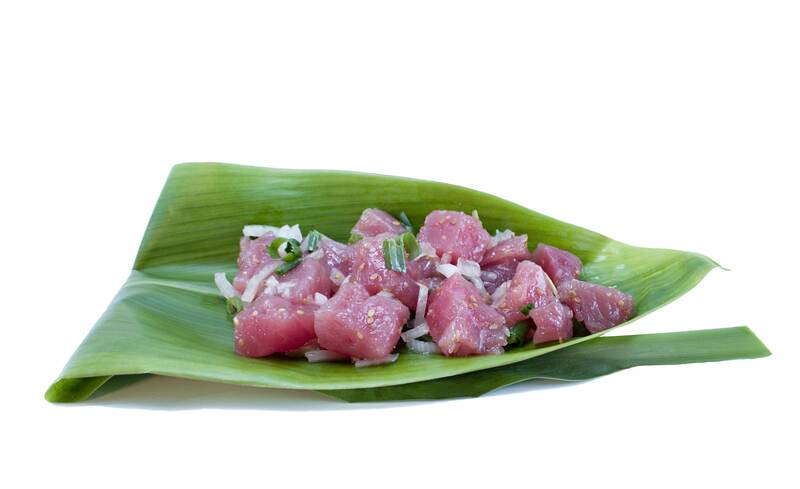 Laulau are a savory dish made with meat and seasonings tied or wrapped in ti leaves. The laulau are usually steamed for several hours. Contents are typically fish, pork or chicken lightly salted. Popular fish include ahi or butterfish. Some on line recipes may call for taro (kalo) leaves from the plant whose roots are used to make poi. But we find ti leaf works just as well. 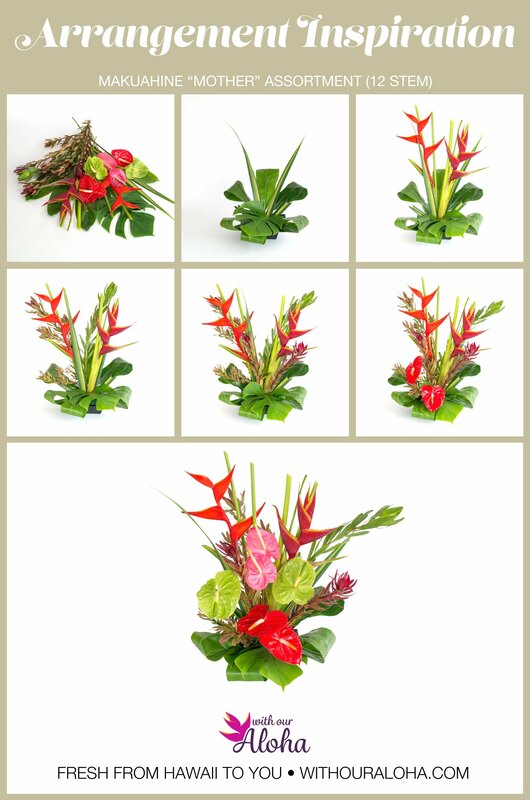 Originally created for Hawaiian Mother’s Day flowers this assortment is great any time of year. 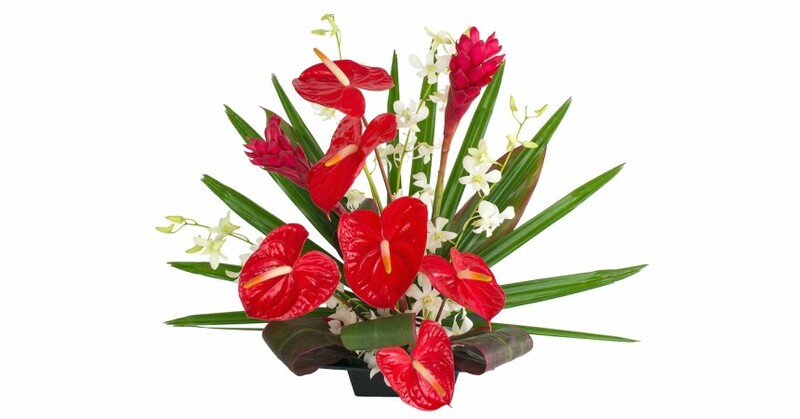 It has a large variety of long lasting tropicals including three different colors of anthurium, tall heliconia and exotic safari sunset. Start with three types of leaves. Place two hala leaves in the back center of the foam. Cut a third hala leaf short and add a V-shaped chevron cut as shown. Place the ti leaves around the base gently folding back as shown. Rubber bands can help hold them in place. Extend the large monstera leaf out to the center front. Add the 2 upright heliconia near the center. This is a heavy flower so make sure it is placed firmly. Add the safari sunset near the center at different angles as shown. Use one ginger opposite of the banksia to balance that side. Place the other at the center right. Use the tropic fleur as the tallest flower in the back. Fill the lower areas with red anthurium. Measure before cutting to make sure they are not too short. Finish with the green and pink anthurium again measuring and trying placement before cutting. Bright tropical reds and greens bring aloha to the holidays. While this is a featured assortment for Christmas it will be beautiful any time of year. Start with the palm leaves – cross them in the center back of the foam as shown. Add the 3 safari sunset near the back of the arrangement. Place the 3 hala leaves as shown with careful bends in two of the leaves. Place 2 banksia protea, one at the back near the center and the other on the right.. 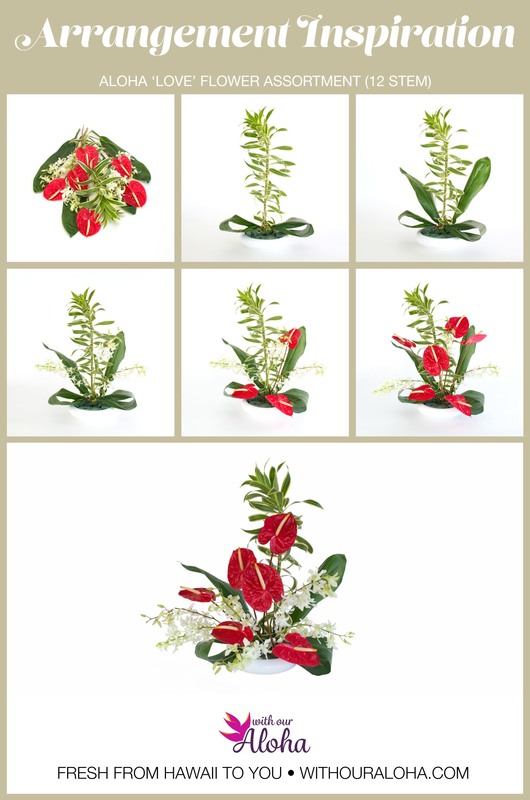 Finish with the green anthurium. 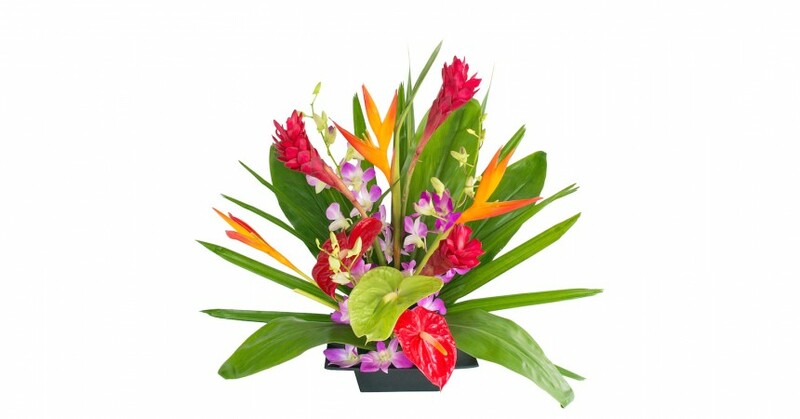 This is our Hawaiian Flowers of the Month selection for December. Heartwarming fresh flowers from Hawaii. 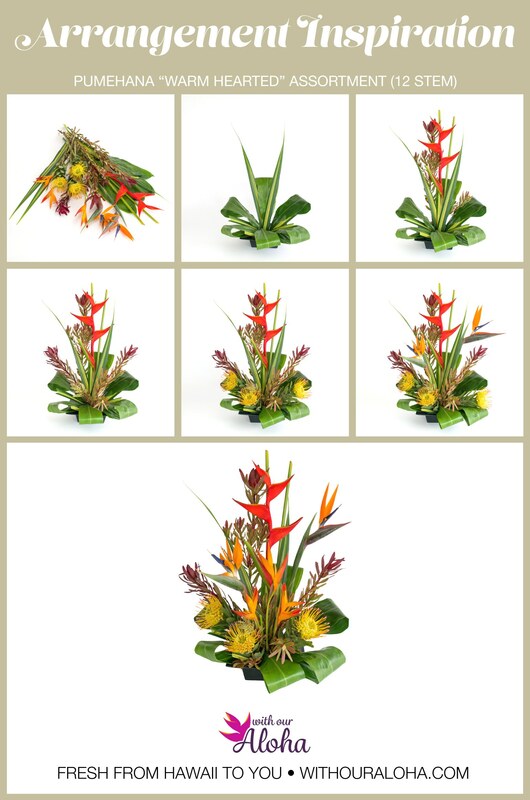 This assortment can be arranged both tall and wide with heliconia, birds of paradise and Maui protea. 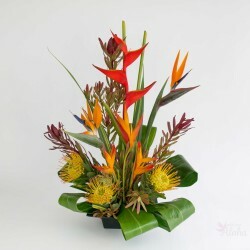 Note that if birds of paradise are not available we will substitute tropic fleur heliconia instead. Begin with the leaves – bend the ti leaves gently back. Secure with rubber bands if necessary. Display 2 hala leaves upright. Cut one hala leaf in 4 smaller pieces. Make a chevron (v-shaped) cut at the ends of the shorter leaves. and then add the tallest upright heliconia. Surround it with leucodendron Safari Sunset. Cut the pincushion protea stems short and use around the base. 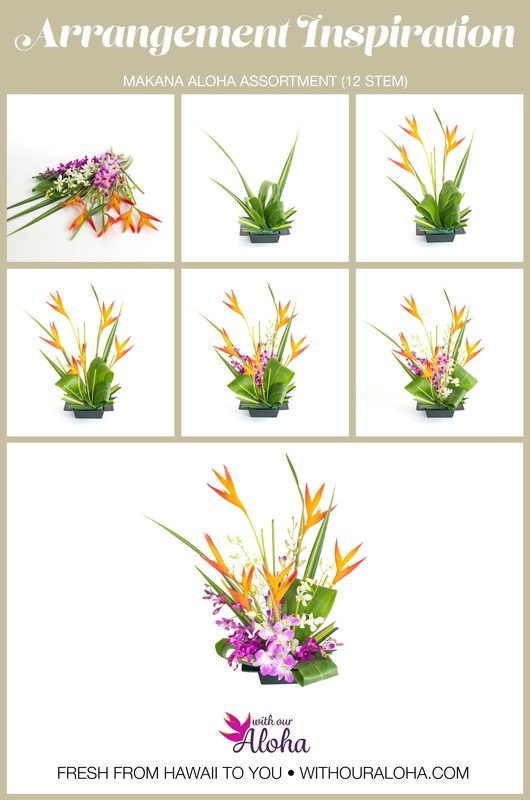 Finally add the birds of paradise and tropic fleur heliconia to complete the arrangement. 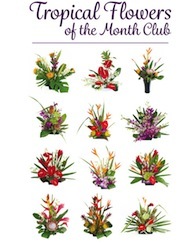 This is our Hawaiian Flowers of the Month selection for November. When you order a Hawaiian flower assortment from With Our Aloha, remember they do not come pre-arranged. The stems are delicately packed at the source, and rush shipped to your door to ensure you receive the freshest flowers possible. 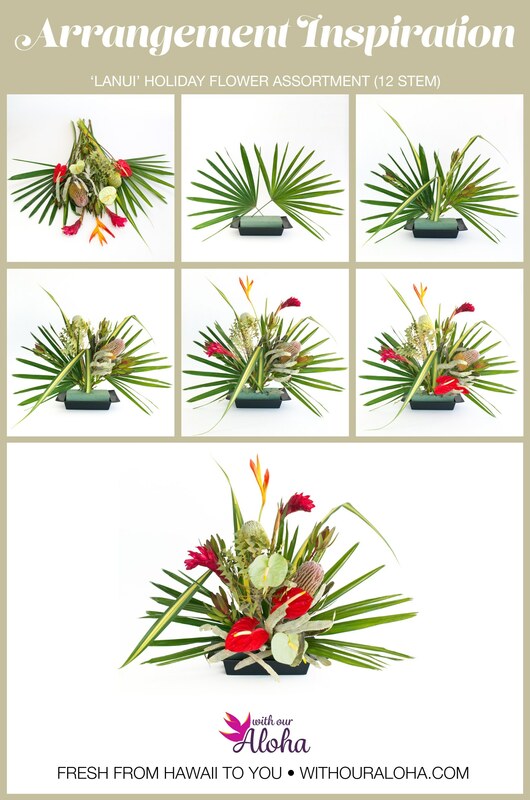 We have provided a Hawaiian flower arrangement DIY that walks you through a “suggested” design below, but the beautiful possibilities are endless. Pink is the theme for this Hawaiian flower DIY arrangement. 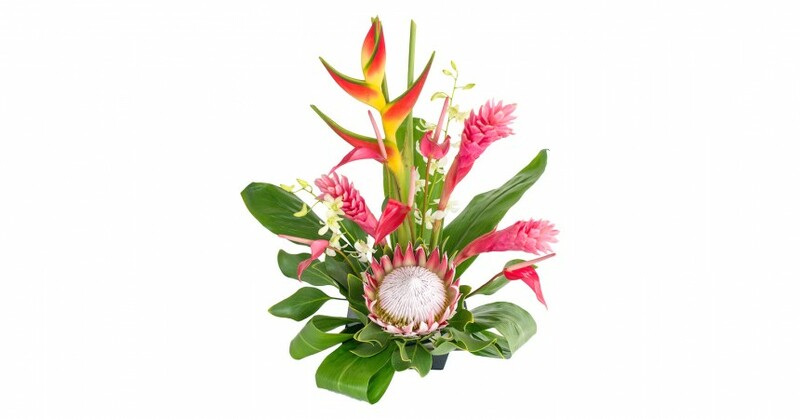 Akala Hula means ‘pink dance’ and this tropical assortment will liven any room or table. It is focused with two large flowers. 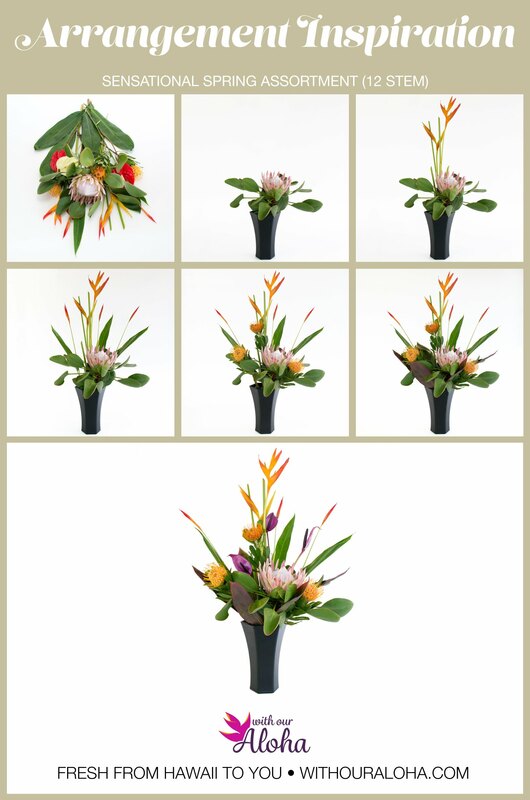 The king protea provides width and the upright heliconia emphasizes the height of your arrangement. Fill it out with pink ginger and lacy white orchids. This is our Hawaiian Flowers of the Month selection for October. 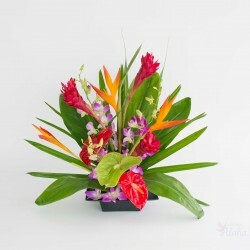 What better way to express love and friendship than with our Hoaloha ‘Good Friend’ assortment. 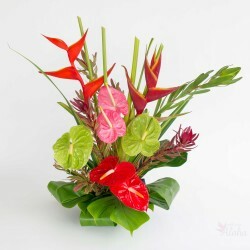 A wonderful mix of Hawaiian flower favorites includes heliconia, ginger, anthurium and orchids. And so easy to create a remarkable display in not time at all. Set the raphis palm in the middle of the foam. Set 3 ti leaves upright about the center of the display. Use the other ti leaves at the base. Bend them back and secure with rubber bands if needed. Insert the 3 tropic fleur as shown. Alternate the red ginger as shown. Fill in with orchid sprays. Use the anthuriums to balance out. Cut short if needed. This is our Hawaiian Flowers of the Month selection for September. Makana Aloha means ‘Gift of Aloha’. This is a bright, happy arrangement easy to create. 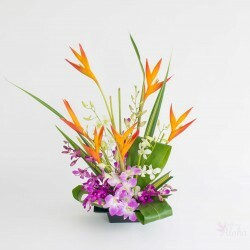 It is a simple mix of tall tropic fleur heliconia and Hawaiian orchids. 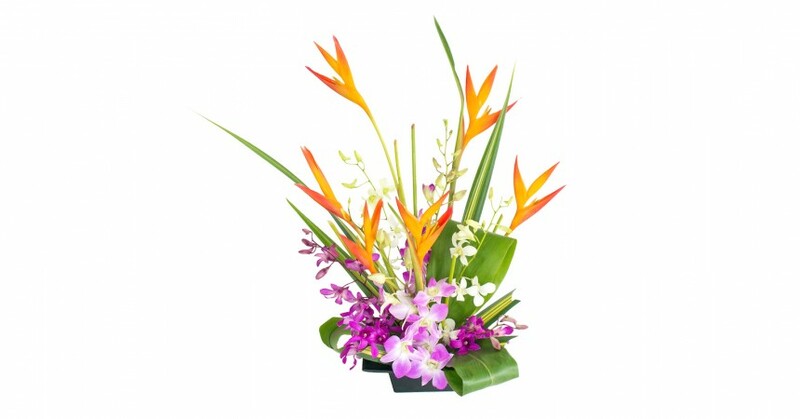 This is our Hawaiian Flowers of the Month selection for August. Bend the ti leaves a show. Carefully secure with rubber bands. Cut part of the bases of the hala leaves. Place the longer sections as shown. Cut the tops of the short hala sections into a V-shaped chevron cut and add to the assortment. Cut 3 tropic fleur shorter and place as shown. Fill in with the orchid sprays. Cut shorter if needed. Hawaiian flower leis are lovely but for keiki (kids) it is more about FUN! As the school year ends many celebrate children moving to the next grade with a ‘graduation’ of their own. For a fun, safe and easy party our candy lei kits bring a Hawaiian touch to your event. Kits come in an assortment of designs and colors. Each kit makes 5 leis. Just use your favorite wrapped candy. Use 20 pieces of candy for each lei. The kits are made from a printed, strong cello tube. Color ties are included so all your little students have to do is slide the candy inside and tie between each piece. The lei is then tied to close. Simple and fun. Candy lei kits also make a great birthday party theme. We have some new designs this year (shown below) and have added them to our web site. In addition to our traditional hibiscus color themes we now have a maile design that resembles the Hawaiian vine worn in graduation ceremonies. The second new design is the ‘kapa’ or ‘tapa’ design, derived from traditional Hawaiian printing and paper making. And of course we’ve added pineapple, a Hawaiian favorite and favorite of kids as well. 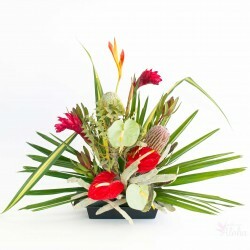 Ahi is the Hawaiian word for ‘Fire’ and this assortment will dazzle with it’s bright red glow. 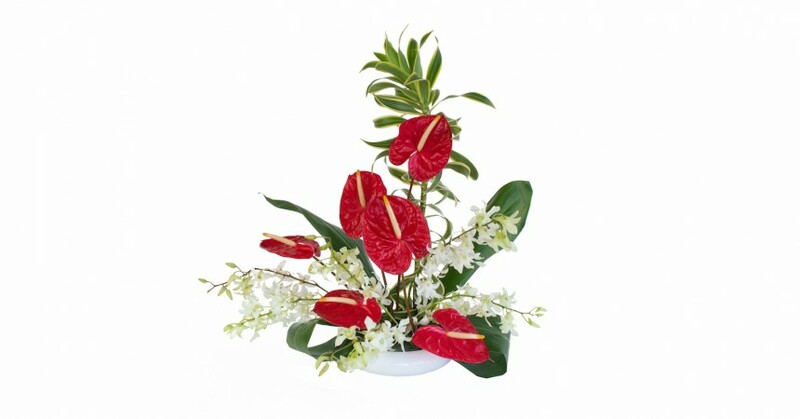 Deep red anthurium and ginger are surrounded by wispy white dendrobium orchids. 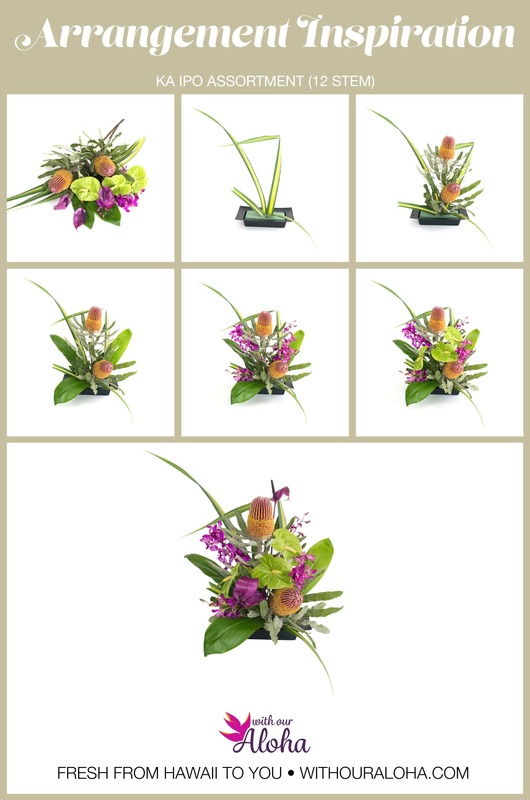 This assortment is easy to arrange and will light up any room. Place the raphis palm leaf in the center of the foam. Add two ti leaves upright behind the palm. Fold the remaining ti leaves at the base as shown. Add one anthurium in the center and 2 gingers on either side. Fill out with anthuriums. Some can be cut short to complete the lower part of the arrangement. 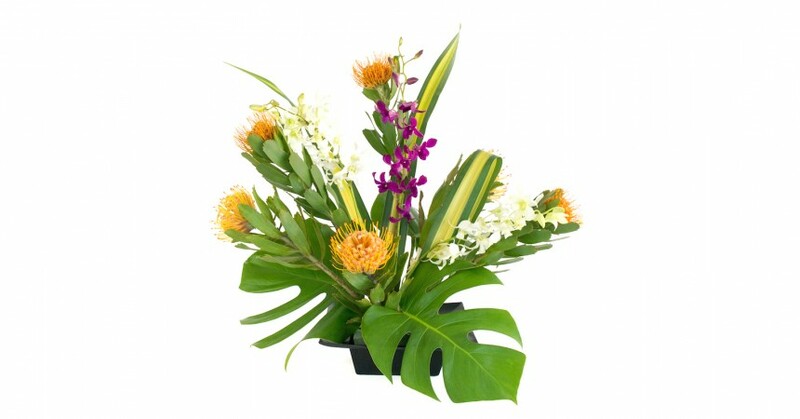 This is our Hawaiian Flowers of the Month selection for July. 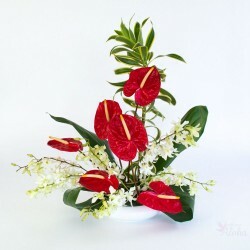 Red ginger, red anthurium, white orchids with Hawaiian foliage. 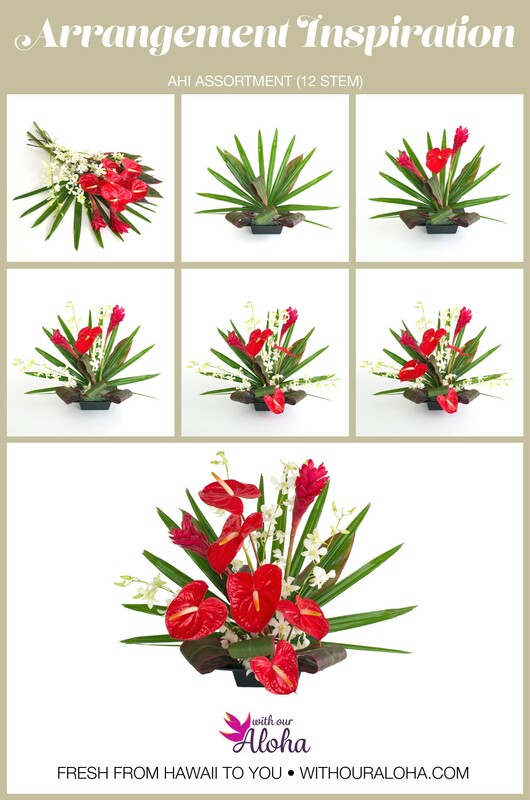 This assortment invokes the bright, warm feelings of fire with stunning reds and wispy white orchids. Hawaiian orchids capture the tones of a moonlit tropical night. 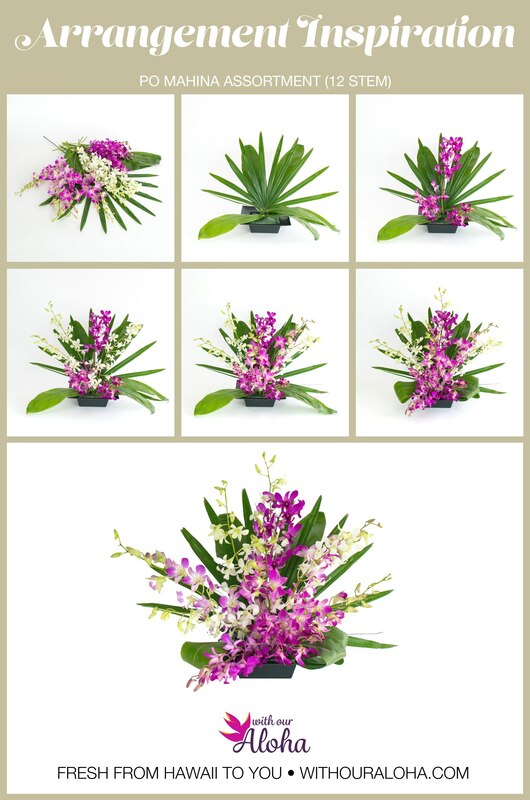 Simple but elegant, dendrobium orchids with background of greenery make a cool and sparking display. Place the raphis palm in the center of the foam. Fill around with ti leaves. They can also be folded under if you prefer. Place the purple orchids in the center. One or two can be cut short and pointed outward. Do the same with the white and lavender orchids. Make sure the arrangement is balanced with no empty spots. This is our Hawaiian Flowers of the Month selection for June. Punahele means ‘Favorite’ and this is one of our favorites. 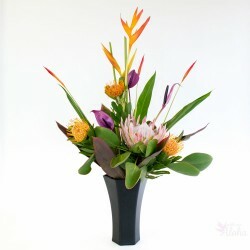 Purple arc tulip anthuriums join golden heliconia and pincushion protea. Red anthurium add a bright dash of color. Send this to someone special to let them know they are your favorite friend or loved one. Start with the ti leaves across the back as shown. Add one ti leaf at a lower profile in the front. Add the hala leaves. One or two can be gently bent as shown. Arrange the three tall heliconia. Add one pincushion near the center. Cut two pincushions short and place on either side as shown. Add one purple arc near the back center. Cut the anthurium to different heights to fill more space in the front. Finish with the 2 purple arcs; cut short to fill where needed. 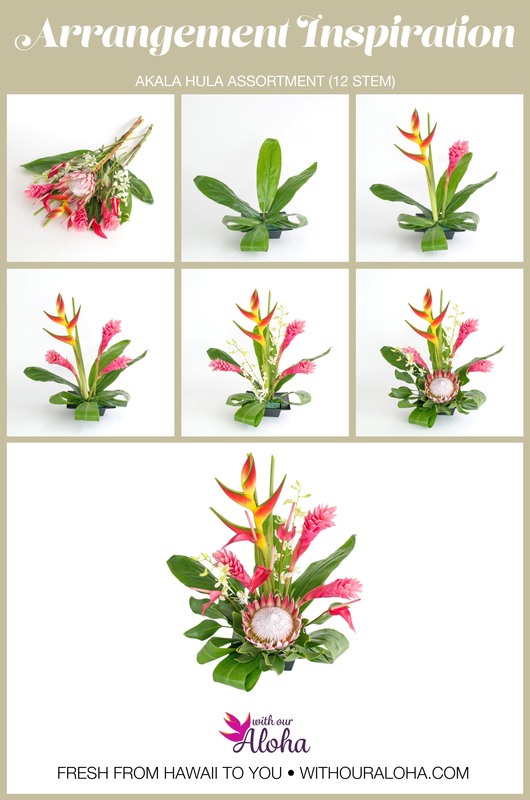 This is our Hawaiian Flowers of the Month selection for May. 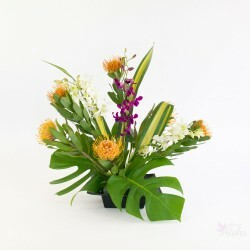 When you order any tropical assortment from With Our Aloha, remember the flowers do not come pre-arranged. The stems are delicately packed at the source, and rush shipped to your door to ensure you receive the freshest flowers possible. 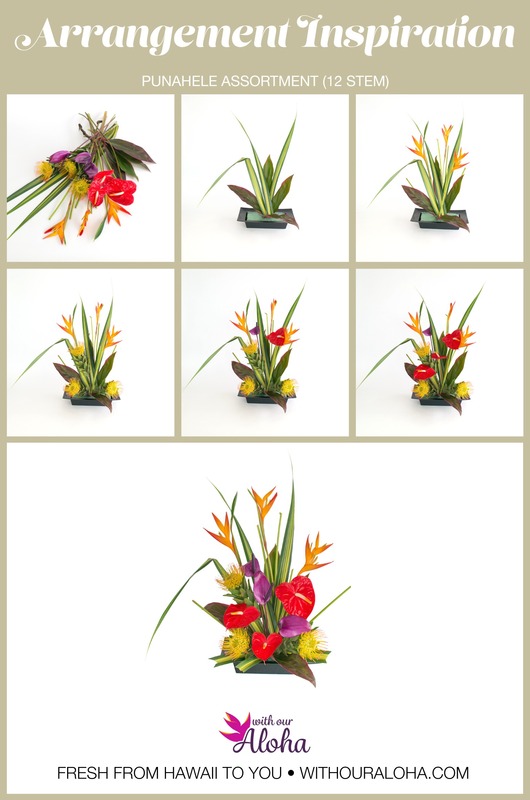 We have provided a tropical flower arrangement DIY that walks you through a “suggested” design below, but the beautiful possibilities are endless. 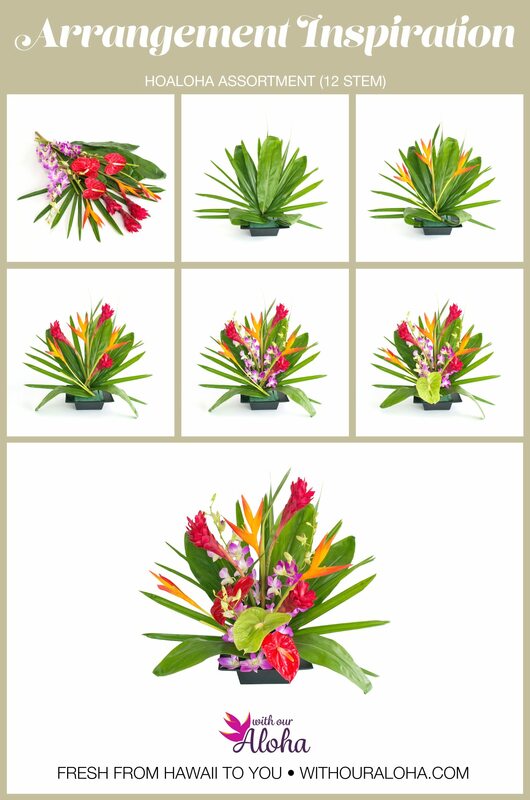 This sensational spring assortment features the best flowers of the Hawaiian spring. King and pincushion protea are enjoying the close of their season over on Maui. 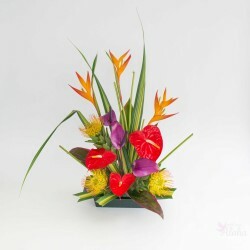 We accent these unusual flowers with tall heliconia and purple tulip anthuriums. This is our Hawaiian Flowers of the Month selection for March. 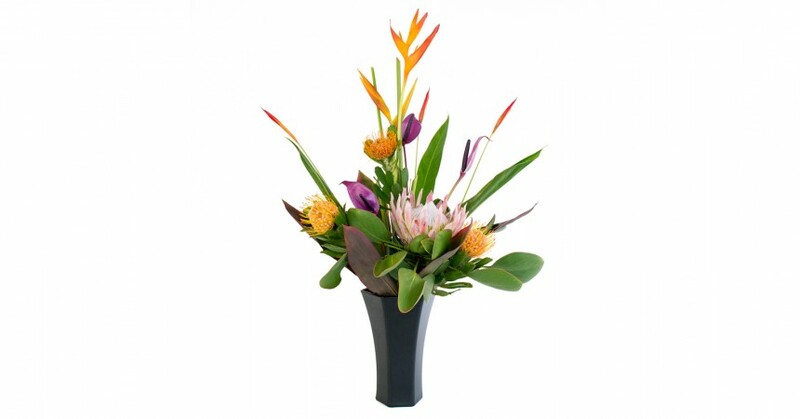 Place the king protea in the center of the vase. Lower foliage can be harvested for filling in at the end. 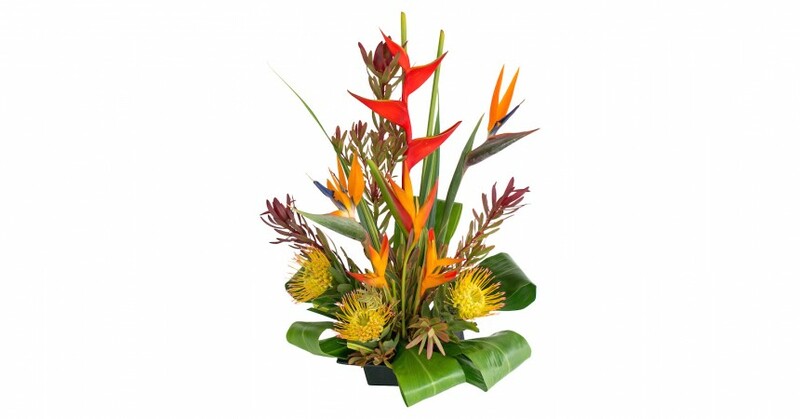 Add the 2 tall tropic fleur heliconia at the center to add height. Array the psitticorum around the tropic fleur. Add ti leaves around the vase. Fill the lower areas with pincushion protea cut to different heights. 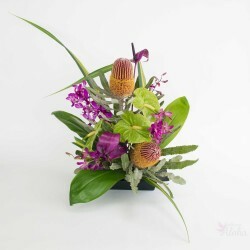 Finish with the purple arc anthuriums around the arrangement. ‘Aloha’ has many meanings in the Hawaiian language. 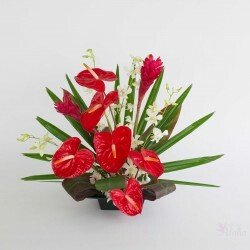 One of the meanings is ‘Love’ and this Hawaiian flower assortment will express your love with bright red anthuriums and delicate white orchids. Bend and secure 2 ti leaves on either side as shown. Secure with rubber bands if needed. Add 2 upright ti leaves. Place 3 orchid sprays evenly as shown. Cut 2 anthurium short and place in the front. Add a long anthurium in front of each upright ti leaf. Fill out with remaining orchids and anthurium. This is our Hawaiian Flowers of the Month selection for February. Makamae means ‘Precious’ in Hawaiian. 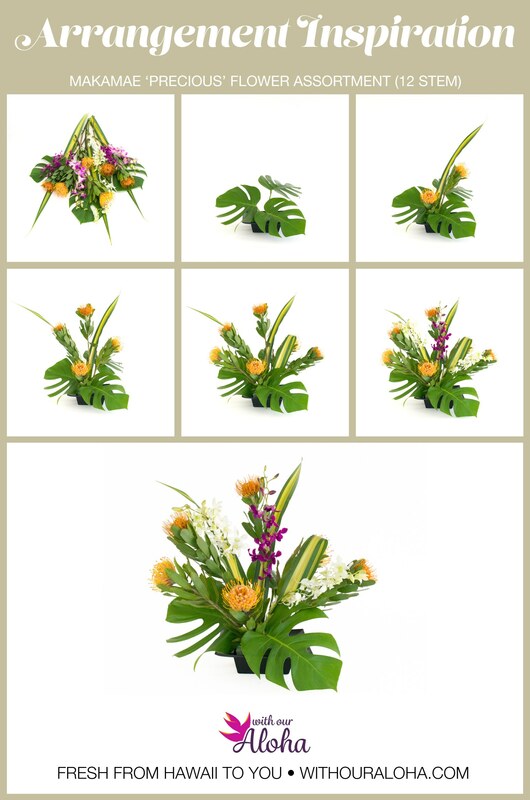 This tropical flower assortment will tell someone how precious they are to you. 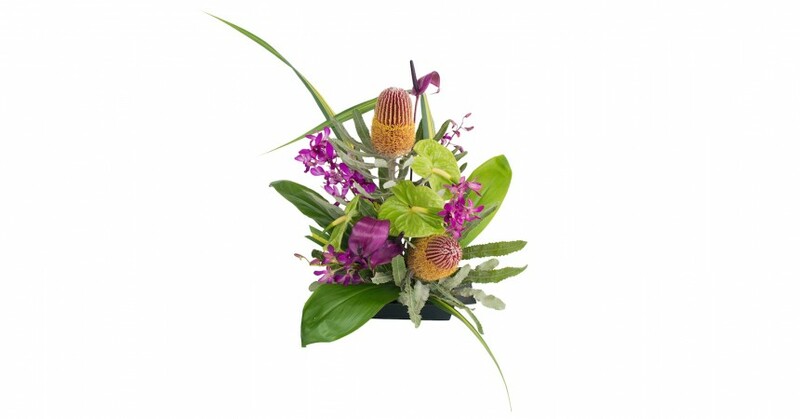 This is a medium height arrangement using pincushion protea and Big Island orchids. The monstera leaves will add width. Begin with the 3 monstera leaves pointing outward from the base. Add a hala leaf in the center and two pincushions. One pincushion in the front can be cut shorter. Continue adding pincushions and hala leaves. A hala leave can be gently bent back for effect. Fill out empty space with the orchid sprays. Some sprays can be cut lower or in half as needed. This is our Hawaiian Flowers of the Month selection for January. You can make your own perfume at home using our essential oils and fragrances. You’ll need a clean glass bottle to mix things in. A dark glass works best as it protects from light. To store your finished perfume a smaller bottle. Again dark glass is better but clear works fine. Two tablespoons of carrier oil to hold the fragrance. Oils such as almond oil or jojoba work well. Four tablespoons of vodka or high proof alcohol. Two tablespoons of distilled water. Tap water should not be used. 1. Add 30 to 40 drops of your favorite oil or combination of oils to your mixing bottle. Test as you go until you find a mix you like again using multiple oils. 2. Mix in vodka and the carrier oil. Shake everything together and then let the closed bottle sit for at least two days. Some combinations can take 4 to 6 weeks to fully rest. Do not refrigerate but keep in a cool, dark location. 3. Open and add the water. Shake thoroughly. 4. Line your funnel with the coffee filter and pour into the storage bottles. This will take some time so go slowly and do not overfill the funnel. 5. Shake again each time before using. It can take time to find your favorite combination so experiment freely with small drops of the oils.